Milan 2011: Vienna designer Marco Dessí will present a collection of furniture made from folded and tubular steel in Milan next week. Called Dakar, the design for Italian brand Skitsch has a chair backrest made from one piece of sheet steel, curled round the tubular structure.Called Dakar, the design for Italian brand Skitsch has a chair backrest made from one piece of sheet steel, curled round the tubular structure. Table legs are constructed in a similar way, while the edges of the chair seat and table top are folded to appear draped over their frames. Marco Dessí’s new stackable aluminium chair Dakar is not just fun and ultra light, but also somewhat of a lesson in thoughtful construction. 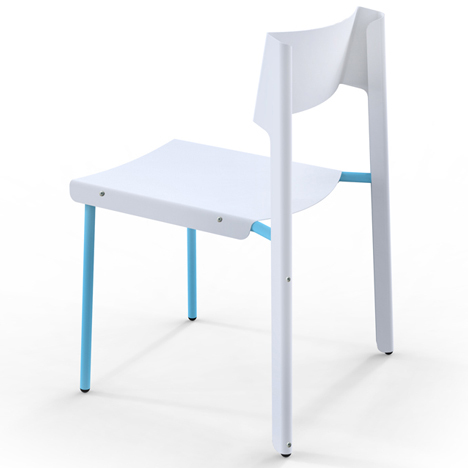 The design of the backrest which is made out of only one metal sheet demonstrates both, the stability and at the same time flexibility of the material when cleverly applied: Covering the tube metal legs of the chair like a dress, the bent metal sheet results in a backrest of grand stability, and still it gives way like a spring when you lean back. This all-metal chair is comfortable! And it comes in five well-selected colors or in combinations between these, thus leaving lots of room for individual taste. The choice of material makes Dakar a light but extremely durable piece of furniture suitable for outdoors just as much as indoors. Like other designs by Dessí, it creates the impression as if it could be taken apart into its basic components within seconds. His constructive approach once more reminds us of earlier and more transparent stages of mechanization while being totally contemporary.